Modern luxury Villa situated atop a small hill offering stunning views of the Mar Menor from the large swimming pool terrace and the Mediterranean from the front. Located within the Calblanque National Park, the villa is a haven of peacefulness with beautiful coves a fifteen minute walk away and the long stretch of the award winning Calblanque beach a ten minute drive. A private 250msq villa with four ensuite bedrooms, modern kitchen, ample dining and living room areas and a games room downstairs with pool table, table tennis and darts amongst others. The swimming pool uses a salt system, not chlorine, so is much kinder to the skin. It is 12mx6m with a huge private terrace which two of the bedrooms open onto including the master bedroom with has it's own seating area. The surrounding countryside is ideal for long walks or mountain biking for the more adventurous. Stables are nearby for riding as is the La Manga club for golfing. The Mar Menor offers opportunities for a wide variety of water sports including excellent scuba diving. Not needed in the Summer! 12m x 6m private salt water system pool so you do not smell of chlorine when you get out. 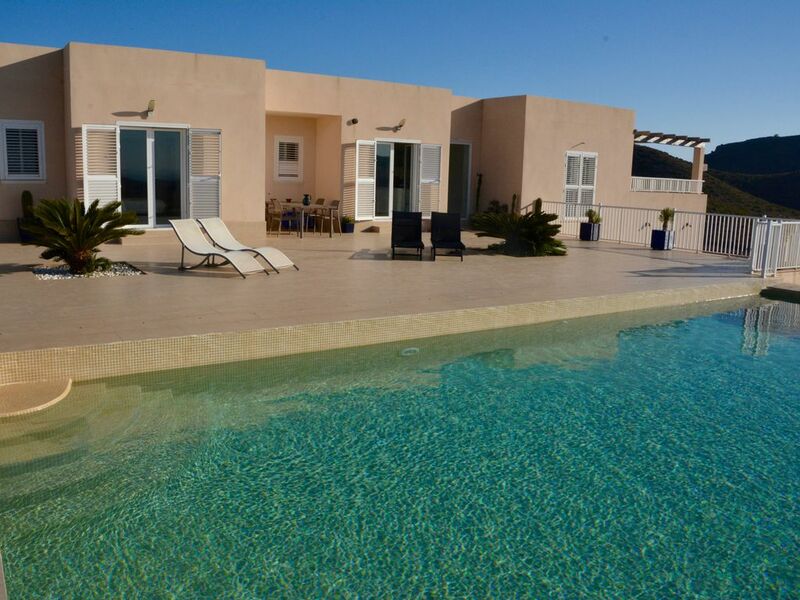 The villa is ideal for self catering for those who wish not to venture out other than buy new supplies. But, if you do want to go out, there are many restaurants in the area, either in La Manga Club, the nearby village of Los Belones or in the pretty little harbour at Cabo De Palos. The nearby La Manga Club also offers Spa, Golf, tennis, Bicycle hire and a whole host of other activities. There are pretty coves a fifteen minute walk away, alternatively one can drive ten minutes to the award winning Calblanque beach. A well appointed property which well equipped to meet the day to day needs of the holiday maker. The large private pool at the villa kept both adults and younger members of our family entertained for hours on end. The remoteness of the villa ensures privacy, but does mean a car is essential for all but the most serious trekkers. The only issue detracting me from awarding 5 starts is that following a power cut to the whole area our air conditioning failed to restart resulting in us using fans and opening windows. Although not a lot could be done at the time, Jason (the owner) was quick to respond to my emails and suggest courses of action. Dear Brian, thank you for your kind review. The large pool does indeed offer many opportunities for fun and the salt water system means that nobody smells of chlorine afterwards. The location in the Calblanque National Park is special as are the 360 degree outstanding views of the sea and surrounding hills. I am glad you enjoyed your stay. La villa est conforme aux photos et descriptifs, avec une grande piscine, à l'écart du village, accessible par un petit chemin. Les chambres sont spacieuses avec la climatisation et de très bon matelas. La cuisine est bien équipée, le salon et la salle à manger sont immenses. Nous avons passés une formidable semaine de vacances en visitant la région, avec des plages de sables fins et de petites criques sauvages. Le propriétaire a été très disponible par mail et nous a fournis tous les renseignements nécessaires. Dear Mr. Deray, thank you very much for your kind review. I am glad you enjoyed the large amount of space that the villa offers and the nearby award winning Calblanque beach and the many hidden coves, it is quite unlike many other parts of Spain. Set in the Calblanque national park the Villa enjoys a tranquil location with stunning views from the pool to the Mar Menor and the Mediterranean from the front. The surrounding hills make for idyllic walks and adventurous mountain biking. The large salt water system swimming pool is completely private and not at all overlooked with a large terrace for relaxing and dining.